HCDPC "Olga Skobeleva" is specialized institution for children deprived of parental care. 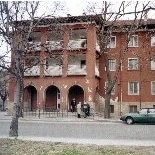 It is a social service unit for social purposes at the municipality of Plovdiv, which provides care and social services in terms of raising, training and educating children and young people from 7-20 years. The capacity of the home "Olga Skobeleva" is 90 children. Our main goal is to help socially disadvantaged children and families to participate in the economic, social and cultural life within the region. We understand this as a chance to help improve the life of the family as we consider the right of children and parents to decide on their own, so if they do not violate the rights of others. We are open to develop and set ourselves new challenges.